OK, I’ll admit that I used this line once in a story many years ago when I first observed the Skokomish River overflowing its banks. I was amazed at the number of chum salmon swimming through farm fields and across pavement in the Skokomish Valley as they tried to get back to their spawning grounds. Despite extensive work in the Skokomish River estuary, the waters still back up and fish still swim across roads during heavy rains and floods. I was not the first to bend the old joke to ask, “Why did the salmon cross the road?” And I was definitely not the last, as two new videos went viral the past few days, resulting in news reports across the country. Hundreds of thousands of people must have been surprised to see Puget Sound salmon skittering across the pavement in a most unnatural way. November 7, 2018 Fishing interests, Hood Canal, Land use, Salmon, Stormwater, Streams, weatherChum salmon, flooding, Salmon, Salmon crossing road, Skokomish River, Why did the salmon cross the road? Salmon appear to be on the move in several local streams, thanks to the recent rains and increased streamflows. Wetter conditions no doubt triggered some of the migratory fish to head back to their spawning grounds. It is still a little early in the season for coho and chum salmon to be fully involved in spawning activity, and there is plenty of time for people to get out and observe their amazing migration. Salmon-watching is often a hit-or-miss situation, although Chico Creek is usually the best bet. After hearing several reports of chum moving upstream, I went out this afternoon to look in several local streams. Unfortunately, I did not get there before the rains stopped. What I saw in Chico Creek and other streams was fish milling about in deep pools, seemingly in no hurry to move upstream. Additional rains and streamflows are likely to get the fish fired up to move in and upstream more quickly. Jack Stanfill, who lives on Dickerson Creek, a tributary of Chico Creek, said at least two adult chum reached his property today. Several restoration projects along Dickerson Creek probably helped the fish get upstream earlier than we have seen in previous years. Jon Oleyar, who monitors the salmon migration for the Suquamish Tribe, told me that chum don’t normally get into Dickerson Creek until two weeks after they get into the upper reaches of Chico Creek. “This might be one of the earliest times ever,” Jon said. As for other streams, the tribal biologist said he has seen early chum in Curley and Blackjack creeks in South Kitsap. Chico Creek: Chico Salmon Park (Facebook) along with a location just above the culvert under Golf Club Hill Road off Chico Way. Also check out the bridge near the 19th Hole Tavern on Erland Point Road and the access at the end of Kittyhawk Drive. Dickerson Creek: Salmon Haven overlook on Taylor Road, off Northlake Way. Curley Creek: Bridge on Southworth Drive near the intersection with Banner Road. 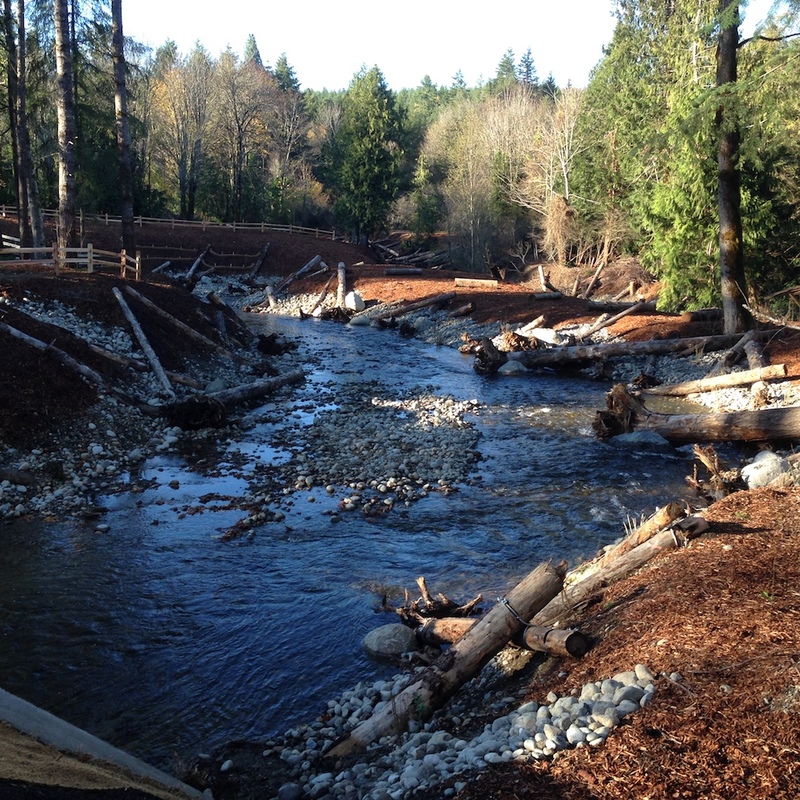 Blackjack Creek: A new bridge at Etta Turner Park between Port Orchard Ford and Westbay Center on Bay Street. Gorst Creek: Otto Jarstad Park on Belfair Valley Road, where a new beaver dam has created a sizable pool of water, The dam may be limiting the migration of coho and perhaps blocking most of the chum. Note for salmon-watchers: This year’s Kitsap Salmon Tours will be held in two weeks, on Saturday, Nov. 4. This year, the popular event has been expanded to seven locations. For details, go to the Kitsap WSU Extension website. It appears that the chum coming into streams on the Kitsap Peninsula this year are noticeably larger in size than normal, perhaps in the 10- to 10.5-pound range, Jon Oleyar told me. That exceeds the normal 8- to 10-pound size for chum, he said. Orca Network reported today that some of our Southern Resident killer whales have been foraging this week off the Kitsap Peninsula as well as in other areas not easily identified because of the dark, stormy weather we have had. Let’s hope the orcas can find enough food to stick around awhile. On Sunday, a small group of whales from L pod showed up in the San Juan Islands for the first time this year. Normally, these whales — L-54 and her offspring along with males L-84 and L-88 — would be seen numerous times during the summer, but this was a highly unusually year. They were seen this week with J pod, which hasn’t been around much either. On Monday, reports of orcas near Kingston and Edmonds suggested that the whales had moved south. They were later spotted near Seattle and then again near Kingston on Tuesday, when they headed out of Puget Sound by evening. It is often said that the orcas will go where the salmon are. They are known to prefer chinook when their favorite fish are available, but they will switch to chum after the chinook run is over. It will be interesting to how much time the whales spend in Central and South Puget Sound, where chum are more plentiful. 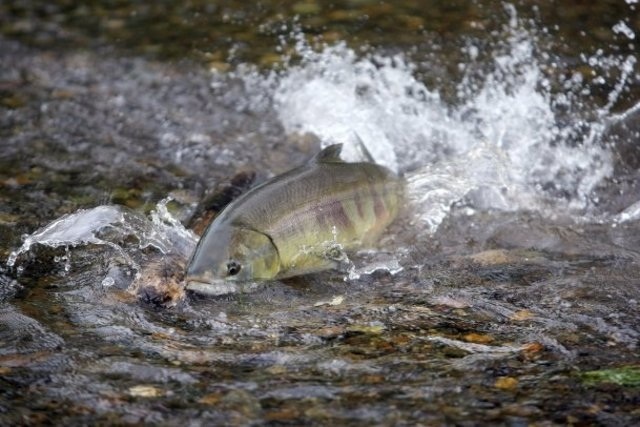 The total number of chum salmon predicted this year — including those harvested along the way — is expected to be lower than last year. Still, there is hope that the preseason forecast will be exceeded by the actual return. 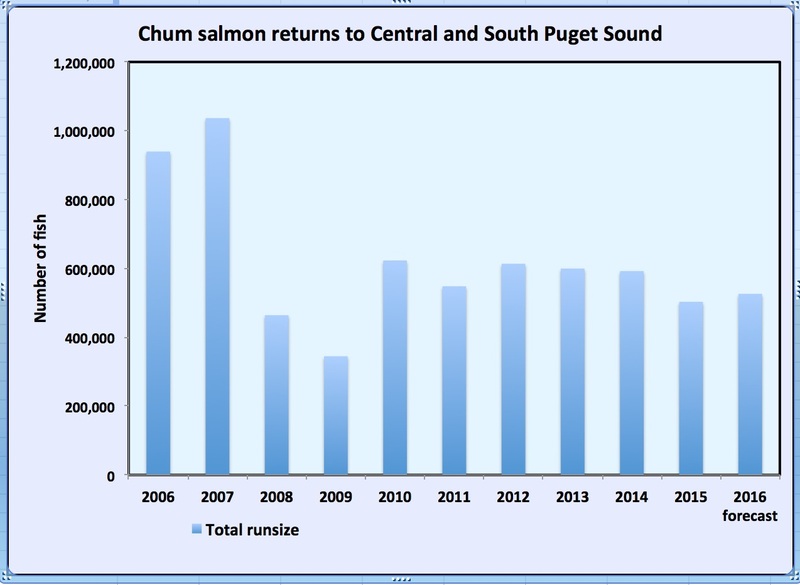 The total predicted for Central and South Puget Sound is 433,000 chum, with 85 percent returning to streams and 15 percent coming back to hatcheries. Last year, the total predicted run was 526,000 chum, about 21 percent higher than this year. Typically, the number of chum returning in odd-numbered years is lower than in even-numbered years, other things being equal. That’s because odd-numbered years is when the vast majority of pink salmon spawn, resulting in increased competition and lower survival for the young chum. Smaller numbers of juveniles mean fewer adult chum that return four years later during another odd-numbered year, continuing the cycle. Most of the difference between last year’s and this year’s chum run can be accounted for in the odd- versus even-numbered years, said Aaron Default of the Washington Department of Fish and Wildlife. It is too early in the season to update the preseason forecast based on commercial and tribal fishing that has taken place so far, Aaron said. As usual, fishing seasons are likely to be adjusted up or down when more information becomes available. The main goal is to make sure that enough fish make it back to sustain and potentially increase the salmon population. Sam Wright, who has been remarkably successful in getting various fish species protected under the Endangered Species Act, has learned that his latest ESA petition — possibly his final petition — has been rejected. Sam, who retired from the Washington Department of Fish and Wildlife after years of studying salmon and other fish, would like to get special recognition for a unique population of chum salmon that return to South Puget Sound in the winter. The Nisqually-Chambers Creek run of winter chum is the only population of chum salmon in the world that spawn as late as February, with some fish entirely missing the worst floods of December and January, Sam told me. His petition to the federal government was designed to get these winter chum recognized as a distinct population segment — much as the threatened summer chum population in Hood Canal has been designated as separate from the fall runs of chum throughout Puget Sound. Being a small population, the Nisqually-Chambers Creek winter chum would probably qualify for threatened or endangered status, he said, but first it would need to be recognized as distinct. If not listed initially as threatened or endangered, those decisions could follow if the population crashes, he said. “The petition was meant to correct what was, from my perspective, a mistake made 20 years ago when they made a coastwise series of reports assessing the chum salmon populations,” said Sam, who is now 81 years old. Sam’s petition (PDF 4.2 mb), filed more than two years ago, was subject to a 90-day review by the National Marine Fisheries Service, also known as NOAA Fisheries. Sam was told that the petition had been misplaced all this time. Last week, he got the news that the Nisqually-Chambers Creek winter chum would not be recognized as a distinct population, nor would it be considered for further review without new information being brought forward. Sam argues that the winter chum remain genetically isolated from fall chum populations because of their unusual spawning schedule. That is demonstrated by annual population counts, which go up and down independently of fall chum numbers in South Puget Sound. “They are reacting to different environmental conditions,” Sam explained. Studies are needed to show the differences, Sam said, but they may have an advantage over fall chum by avoiding most of the winter floods, which can displace salmon eggs incubating in the gravel or else smother them in silt. Incubation time is based on temperature, so the late-arriving chum are subject to warmer water and faster incubation. The winter chum fry are only a little behind the fall chum fry, Sam said. 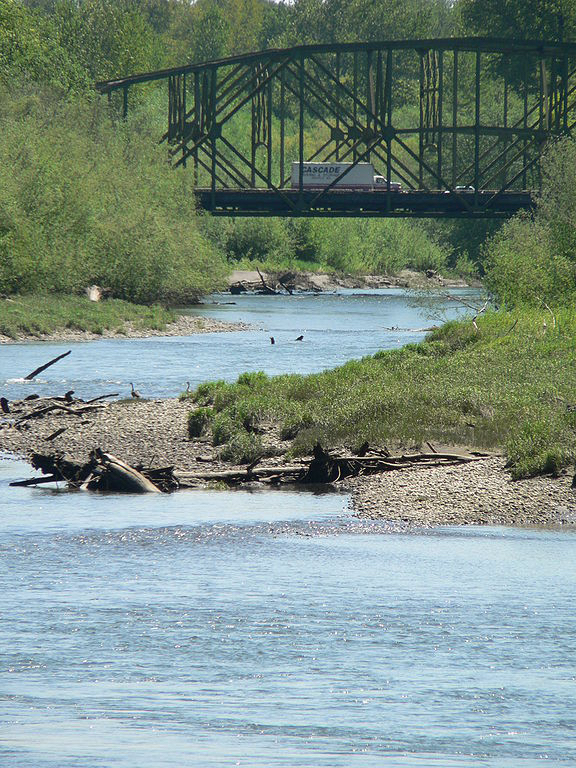 One of the most productive areas for winter chum is Muck Creek, a tributary of the Nisqually River that runs through Joint Base Lewis McCord, where the Army conducts military exercises, according to Sam. “We’ve had decades of battles with Fort Lewis over whether to use Muck Creek as part of their firing range,” Sam told me, adding that he suspects that pressure from the military played a role in NOAA’s original decision to lump the winter chum together with the fall chum. Personally, I don’t know anything about such conflicts, but Muck Creek has been the site of a major restoration effort involving JBLM, the Nisqually Tribe and other groups. In 2011, reporter Ingrid Barrentine wrote about the annual salmon homecoming for Northwest Guardian, a JBLM publication. As for the habitat in Muck Creek, Sam told me something else that was surprising. The stream is spring-fed with freshwater bubbling up from below and providing stable flows, he said. That helps the eggs to survive. Unlike many streams in which only 10 percent of the chum eggs grow into fry headed for saltwater, Muck Creek has had a 90-percent survival rate. One reason that Sam is so concerned about the Nisqually-Chambers Creek winter chum is the uncertainty about what is coming in the future. Climate change is likely to bring higher stream flows in winter, he said, and chum runs that come later may hold the keys to survival of the species. Sam Wright’s persistence has paid off in the past when he has asked for reconsideration and finally received threatened or endangered status for various populations of salmon, steelhead, rockfish and other marine species. This time, he may or may not provide additional information and ask the agency to reconsider its position. In any case, Sam told me that he has no new petitions in the works, and this may be his last effort. The population must represent an important component in the evolutionary legacy of the species. In turning down Sam’s petition, reviewers pointed to genetic studies that supported the finding that summer chum in Hood Canal and the Strait of Juan de Fuca were distinct from other chum runs. A second grouping included the remaining fall, summer and winter runs in Puget Sound, with a third grouping of fall chum from the Strait of Juan de Fuca, the Washington Coast and Oregon. The reviewers also pointed out that the Nisqually River and Chambers Creek to the north are not geographically isolated from the rest of South Puget Sound. As for “evolutionary legacy,” Sam contends that loss of the winter chum would be forever, as with extinct summer chum in many river systems including Chambers Creek. That critical issue, he said, is the very definition of legacy. The reviewers of his petition found, like the 1997 review team, that winter and summer runs in Puget Sound only showed “patterns of diversity within a relatively large and complex evolutionarily significant unit,” known as an ESU. Early and continuing rains in October have increased streamflows and brought coho and chum salmon into their spawning territories ahead of schedule this year. I was out and about today, taking a look at some of the streams in Central Kitsap. I couldn’t pass up the chance to enjoy the sunny and warm weather, and I was pleased to encounter a lot of other folks doing the same thing. Adults of all ages, some with children, were out looking for the elusive salmon. That’s not something I ever saw 10 years ago while making my rounds to public salmon-viewing spots. I believe the growing interest in salmon may result from ongoing promotions of salmon watching by governmental and volunteer organizations, as well as the news media. Why shouldn’t we go out to watch salmon swimming upstream and possibly, if one is lucky, catch a glimpse of spawning behaviors? After all, we live in one of the best areas for this enjoyable pastime. On the outside, chum and coho salmon don’t seem all that different from one another, not when you consider the variety of fish in Puget Sound — from herring to halibut along with dozens of other odd-looking creatures (EoPS). But we know that if you place coho in stormwater taken from a heavily traveled roadway, the coho are likely to die within hours. But if you do the same thing with chum, these hardy fish will barely notice the difference. In this photo taken two years ago, Jenifer McIntyre describes her discoveries about rain gardens at the Washington Stormwater Center in Puyallup. Later, Jenifer McIntyre, a researcher with Washington State University, collaborated with Scholz to refine the studies, exposing adult coho and later young coho to stormwater under controlled conditions. Much of that work was done at the Suquamish Tribe’s Grover’s Creek Hatchery in North Kitsap. The researchers also measured the physiological effects of pollution on zebrafish embryos during their early stages of development. Working at the Washington Stormwater Center in Puyallup, Jen made a remarkable discovery that has dramatically changed people’s thinking about stormwater treatment. 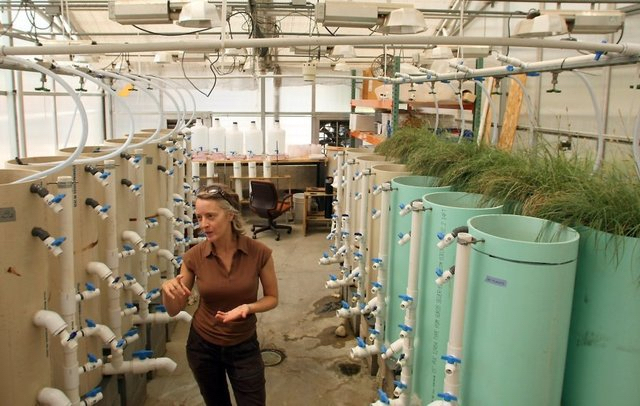 She found that if you run the most heavily polluted stormwater through a soil medium containing compost, the water will no longer have a noticeable effect on the sensitive coho. Rain gardens really do work. Now, Jen, who recently joined the faculty of WSU, is beginning a new phase of her research, probing deeper into the physiological responses of coho salmon when exposed to polluted stormwater. She told me that the varying responses of coho and chum offer clues about where to look for problems. Researchers in Japan have discovered that different kinds of fish have different subunits in their hemoglobin, which are the proteins in red blood cells that carry oxygen to the vital organs. Since coho and other salmon may have different forms of hemoglobin, oxygen transport in the blood is a good place to start this investigation, she said. From there, the issues of blood chemistry get a little technical, but the ability of red blood cells to carry oxygen can depend not only on the form of hemoglobin but also on the pH (acidity) of the blood, she said, and that can be altered by drugs and other chemicals. Another thing that researchers may be seeing is “disseminated intravascular coagulation,” a condition that results from clotting in the lining of the capillaries. DIC can reduce or block blood flow where it is most needed and eventually cause organ damage. That’s an area for more research, Jen said, noting that these investigations are moving forward in collaboration with researchers at NMFS and the U.S. Fish and Wildlife Service. Meanwhile, Jen is working with chemists at the University of Washington’s Center for Urban Waters in Tacoma to figure out which substances — out of hundreds of chemicals found in stormwater — could be causing these deadly effects on fish. If isolating the dangerous compounds proves too difficult, researchers might be able to start with the original toxic sources, perhaps exposing fish to chemicals found in tires, oil, antifreeze and so on, Jen said. For those effects, it might be good to begin the investigation with the well-studied zebrafish embryos, which are transparent and can be observed closely throughout their embryonic development. Needless to say, this is a field of intense interest. If researchers can discover what is killing coho, they might begin to understand why the recovery of chinook salmon in Puget Sound has been so slow. Chinook, which could be added to Jen’s studies, are listed as a threatened species under the Endangered Species Act and are the preferred prey of Puget Sound’s killer whales, which are listed as endangered. Chum salmon more resistant to runoff pollution,” Kitsap Sun, Tristan Baurick. “Saving salmon in the wild – is chum the king?” WSU News, Linda Weiford. Killer whales were back in Puget Sound today, spotted early this morning near Vashon Island, in the afternoon near Seattle and after dark near Point No Point in North Kitsap. Reports can be seen on Orca Network’s Facebook page. It’s a reminder that chum salmon are now running in Puget Sound, and the whales are close behind. The chum also are entering our local streams. So this is the time to visit your nearest salmon stream to see if the fish have arrived. 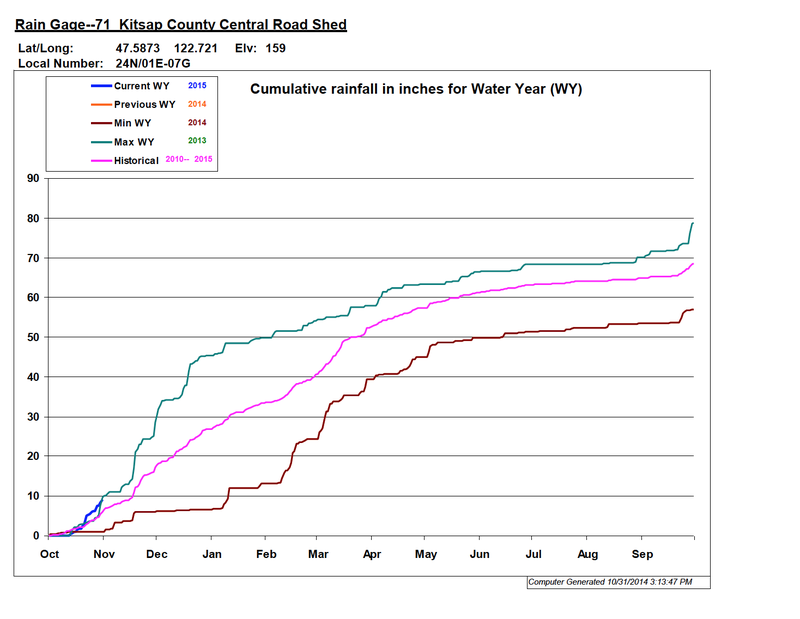 Tristan Baurick wrote about recent conditions for the Kitsap Sun. As always, if you wish to see chum swimming upstream and possibly spawning, one of the best places to go is Chico Salmon Park next to Kitsap Golf and Country Club. For the latest information about the park, read the story in the Kitsap Sun by Terri Gleich. 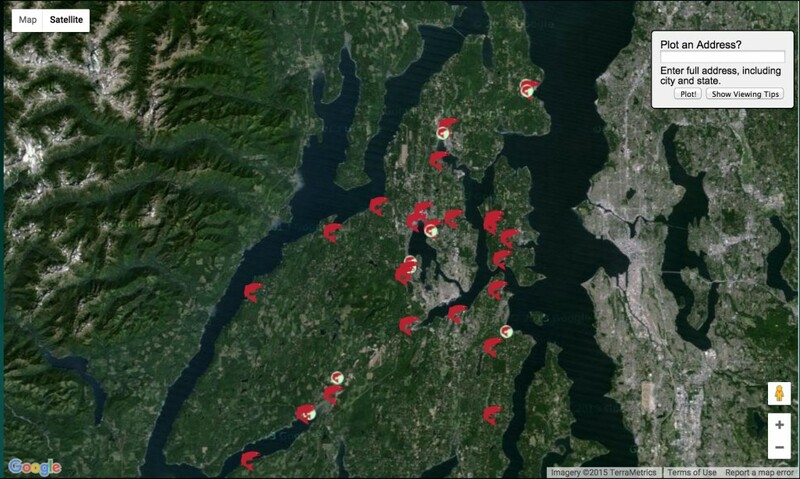 With a couple of updates, my Salmon Viewing Map and videos still offer a guide to the best public spots to watch salmon on the Kitsap Peninsula. Click on the map at right to access the videos and other information, including viewing tips. Saturday, Nov. 14, Chico Salmon Park, Chico Way at Golf Club Road, 10 a.m. to 2 p.m. No charge. Kitsap Salmon Tours. Saturday, Nov. 14, Mountaineers Rhododendron Preserve, 3153 Seabeck Highway. Tours, involving a hike of about 1.5 miles, begin at 10 a.m., 11:30 a.m. and 1 p.m. Nov. 14. Kitsap Salmon Tours. Prompted by stream biologist Jon Oleyar. my grandson, Kevin Jeffries, and I visited Gorst Creek today during a break in the heavy rains. As I reported in Water Ways yesterday, Jon, who counts salmon for the Suquamish Tribe, had observed an unusual number of coho salmon swimming upstream in Gorst Creek. Because of heavy rains, the creek was running high and very fast this afternoon, and the waters were a muddy brown. In fact, the sediment load was so heavy that we spotted only a few fish swimming upstream. We suspected that a lot of them were hunkered down in deep pools, waiting for the flows to decline and the stream to become more passable. Although we did not see a lot of fish, it was exciting to watch coho salmon trying to jump up into an outlet pipe that discharges water from the salmon-rearing raceways in the park. Coho, wearing their spawning colors of red, are known as jumping fish, but these guys were going nowhere fast. Check out the video on this page. I’m looking forward to returning to the stream after the rains decline and the waters clear up a little bit. The coho may or may not be gone by then, but Jon expects that we should be able to see chum salmon in Gorst Creek at least until Christmas. The on-and-off rains over the past two weeks are nearly perfect for both spawning salmon and for recharging shallow groundwater supplies, experts say. 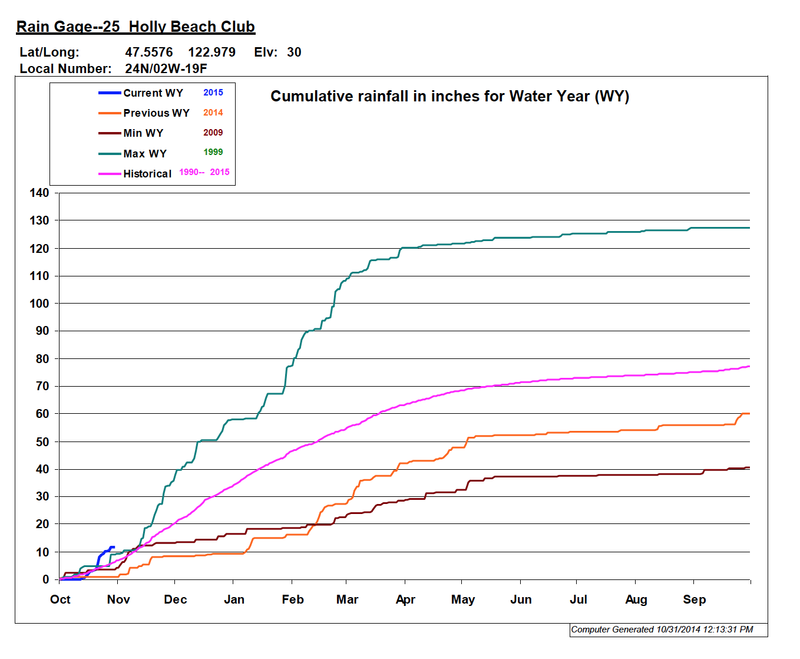 For October, total rainfall ranges from about 5 inches at Hansville to 12 inches at Holly, according to rain gauges managed by the Kitsap Public Utility District. Fortunately, those rains have not been delivered to us in only a few days. The intermittent nature of October rains has allowed the streams to maintain their flows without flooding. They’ve also allowed infiltration into the ground without excessive runoff. In other words, the streams have not risen excessively fast. Bob attributes that to how dry the ground was before the rains began. 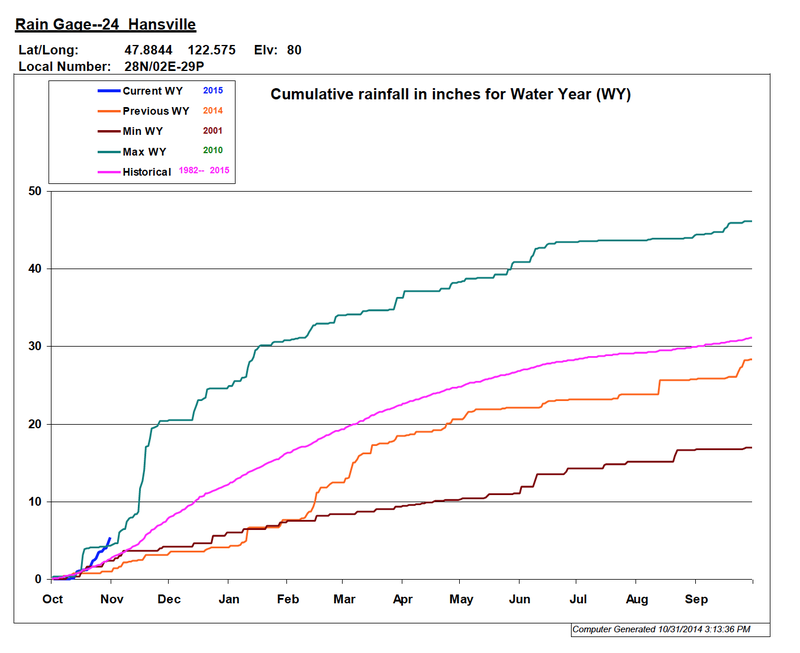 Soils were able to absorb much of the early rainfall before stormwater runoff began to increase. Pauses between the rainstorms allowed more of the water to soak into the ground. “It just goes to show you the variability that we have around here,” Bob told me. Meanwhile, the rain pattern in October was nearly perfect for salmon, said Jon Oleyar of the Suquamish Tribe, who walks the East Kitsap streams to count migrating salmon as they arrive. When there is not adequate flow, the salmon often wait for the streams to rise. On the other hand, too much flow can wash salmon eggs out of the streambed. Last week’s rains got the chum salmon moving into most of the East Kitsap streams, Jon told me. “I checked Chico Creek on Wednesday, and there were almost 11,000 fish in there and going up about as far as they can get,” he said. A good escapement for the Chico Creek system is between 12,000 and 15,000 chum, and there is still more than a month left — assuming a typical timing of the run, he said. But things are looking a little different this year, he noted, and the bulk of the run may have arrived already. 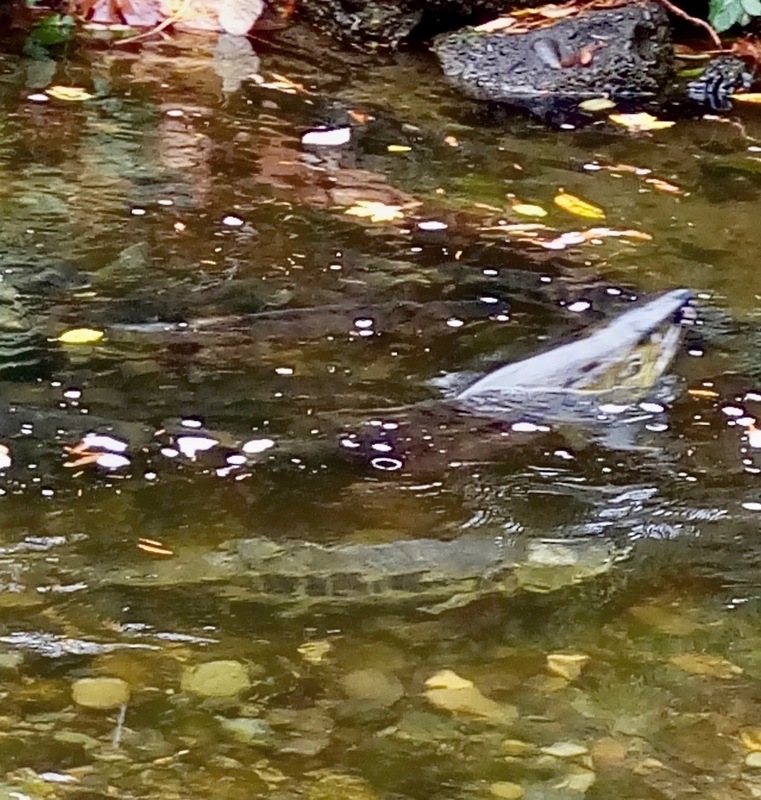 One indication that timing could be different this year is that Gorst Creek already has a fair number of chum salmon — perhaps 500 — yet the Gorst Creek run usually comes in later and continues well into December. Is it possible that all or most of the salmon runs are coming in early? It’s a question that only time will answer. Jon told me that he’s a bit water-logged at the moment, trying to count fish in the rain with the streams running high.